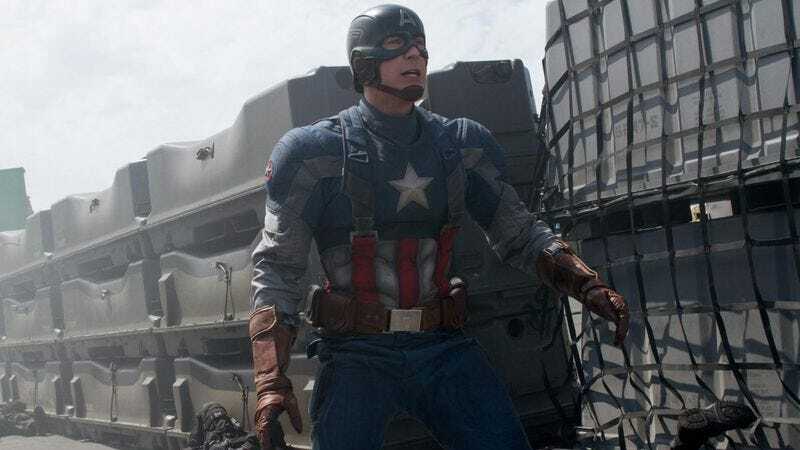 America’s current fad for the Bible simply couldn’t compete with its deeply ingrained worship of comic books, as Captain America: The Winter Soldier easily trounced last week’s No. 1 movie, Noah. Marvel’s latest chapter in the Avengers universe opened with $96.2 million, besting 2011’s Fast Five to set a new record for an April debut. It also took in nearly $11 million more than Thor: The Dark World, and improved 48 percent over its predecessor. As Box Office Mojo notes, that makes Captain America the biggest beneficiary of the “Avengers bump” so far—though its figures obviously don’t take into account sales of shawarma, or the fact that Agents Of S.H.I.E.L.D. is still on the air. While Noah fell 61 percent in its second week, God’s not dead just yet—at least, at the box office—as evidenced by the continued success of, yes, God’s Not Dead. The Christian film expanded to 580 more theaters that people could occupy to send this morally bankrupt nation a message, climbing to fourth place just behind another Chosen One tale, Divergent. Meanwhile, the Wes Anderson faithful similarly flocked to The Grand Budapest Hotel, as it added nearly 300 more theaters to land in the top five at last. Without similar efforts from local Wes Anderson churches to rally around it, however, its own staying power is less assured. In limited release, the mating rituals of lemurs proved to be just barely more attractive than those of Scarlett Johansson, as Island Of Lemurs: Madagascar took in only about $45,000 more than Under The Skin, despite playing in 37 IMAX theaters to the latter’s four, regular-priced theaters. (For a real apples-to-apples comparison, the two should probably trade places next weekend.) And Frankie And Alice—a film that earned Halle Berry a Golden Globe nomination over three years ago, despite no one outside of Cannes ever seeing it—earned a modest $350,000 in 171 theaters, suggesting that the audience’s faith in the opinions of the Golden Globes is not as steadfast as one might believe.